We are just days away from the start of the Occasions Catalog and Sale-abration. This also means that we are down to the last two days of the Holiday Catalog and Year-End Close Out sale. I cannot wait to share more of the awesome products that are coming very soon. You are going to flip for the new catalog. Today I’m sharing one of the new products coming in the Sale-abration Catalog. Coloring books are a hot trend right now. Adults everywhere are digging out colored pencils and coloring again. One of the fabulous new products is a pack of 12×12 paper that comes just in black and white and is intended to be colored by our brand new watercolore pencils. These pencils are great. The pattern paper Inside the Lines is free with a $50 pre-tax/shipping purchase. You could purchase the supplies to make this card and then you would get the paper for free. 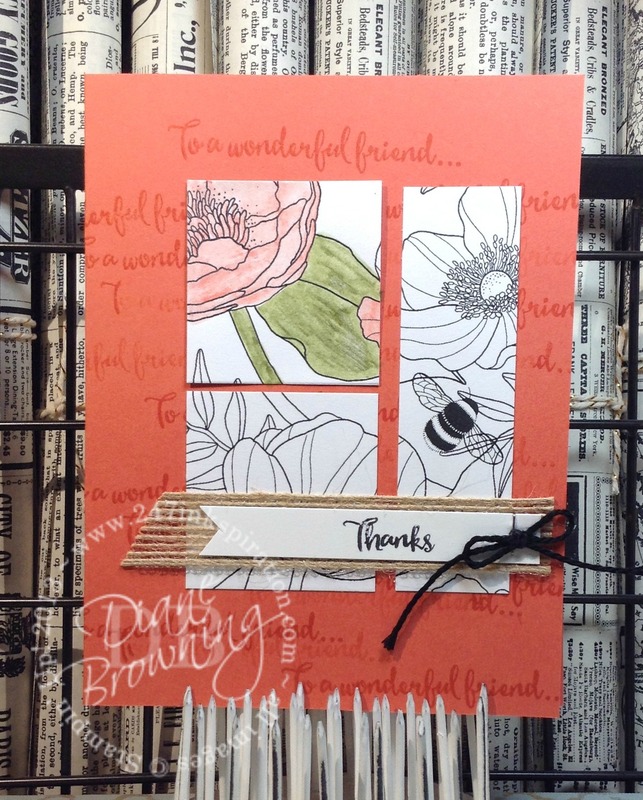 This card was actually designed by Stampin Up and was one of our Make & Take projects at OnStage last November. I love getting the chance to see the new products up close before purchasing them. This is one of the key reasons that I go to these events. We are at the end of the Year-End Closeout Sale. Be sure to take advantage of the awesome deals before things completely sell out. You can click the “Closeout” link on the right and it will take you to that section of my store. This is the last month for the Holiday Catalog. This year, Stampin Up has given us a list of products from the Holiday Catalog that will remain available after the Holiday Catalog ends on January 3rd. See below for the Holiday Carryover List. And if there’s anything from the Holiday Mini Catalog, that you didn’t purchase yet, this is your last chance before the Catalog ends on January 3rd. You can see the Holiday Carry-Over List below. If the item is not on the Carry-Over List, that does mean it is being discontinued. If you need help with any selecting products, I’m here for you. Here are December’s Specials.